It was indeed a solemn, dignified and historical event. It lighted the significant role persons can play in helping fellow human beings, said one of the members of the St John’s Brigade last week. 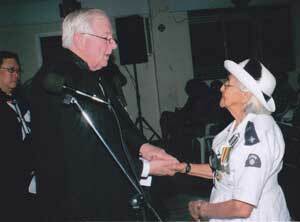 The occasion was the investiture of Vibert Parvatan and Ms Agatha Edwards. Fr. Malcolm Rodrigues, who conducted the service, gave the religious significance as well as the moral commitment persons have to demonstrate love and kindness. He congratulated the recipients of the insignia and referred to their many contributions in Guyana. Sub Prior Professor Villis Marshall who travelled from Australia and who invested Mr Parvatan and Ms Edwards, stated, “I wish you to know that investing you today, I am not acting in virtue of my own office, but on the instructions of Her Majesty Queen Elizabeth II, the Sovereign Head of our Order, and on behalf of His Royal Highness the Duke of Gloucester, The Grand Prior. He recapitulated the significance of the Order of St. John which is that of chivalry, and which dates back centuries ago. The Sub Prior referred to the worldwide network of St. John, which is operating in more than 40 countries. He congratulated Mr. Parvatan on being honoured with the Order of Command Brother as well as Mrs. Edwards on her award of Serving Sister. Mr. Parvatan stated that they were honoured, humbled and grateful for the recognition. Among those present in the packed Ursuline Convent Chapel were Prime Minister Samuel Hinds and Mrs. Hinds; British High Commissioner Mr. Simon Bond who represented Majesty the Queen; Mr. John Mah of Canada St John; Ms. Tahnee Wade and Ms. Pipa Hoyland both of London International St John; Mayor Hamilton Green; Members of Parliament and members of the Diplomatic Corps.